I must be some kind of minor masochist, without all the sexual gratification. I sit myself down in front of polish fumes all day, and then at night, I subject myself to pitch darkness (with the exception of a few lit candles) and flip on scary movies. The scarier, the better. Now that fall's officially here, that means the wave of scary movies is barreling down as well. One of the most anticipated horror flicks is Insidious 2. I've seen the first, and loved it. Though its demon was a little laughable, the jumps were definitely there, so I'll be paying for the second! In addition, I'm satisfying my other guilty pleasure by showing you all some Insidious inspired nail art using polishes from Duri Cosmetics. Duri released a line of 6 colors for the release of the film. Each color is perfect for Halloween! You can purchase any of the 6 colors here for $6. (One more 6 would be a bad omen right?) There's a ghostly white, a creepy green, and deep shades including an oxblood red, a shimmery deep blue, a pitch black, and a gravestone silver. I didn't swatch any of the colors for you. I guess that's my trick for trick or treating. Duri sent me the polishes so I could create super scary nail art, so this was my whack at it! Is it terrifying? Nah. But it gets the creepy factor across right? And, it was awesome enough to be picked up by the editors of Nails Magazine and featured on Salon Fanatic! That excites me. Thanks Duri, for the fun polishes to play with! I was totally inspired by the colors! These products were sent to me by Duri Cosmetics. The reviews are based entirely on my experience with the products and were in no way influenced by anyone. 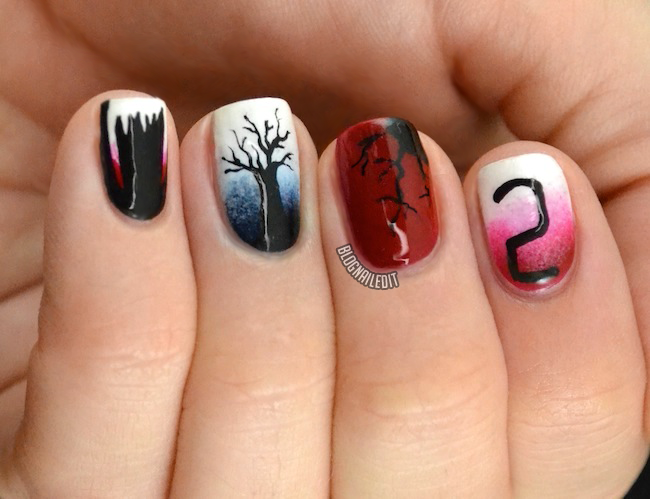 That's really cool - my favourite is the tree on the gradient. Well done!! This is getting me in the mood for Halloween! You totally got the creep factor with this one, especially with the middle two nails. Great job!